Sambhar, a traditional dish of South India. Sambhar is usually served with stamed rice. Sambhar with rice is oue of the main courses of both formal and everyday south indian cuisine. 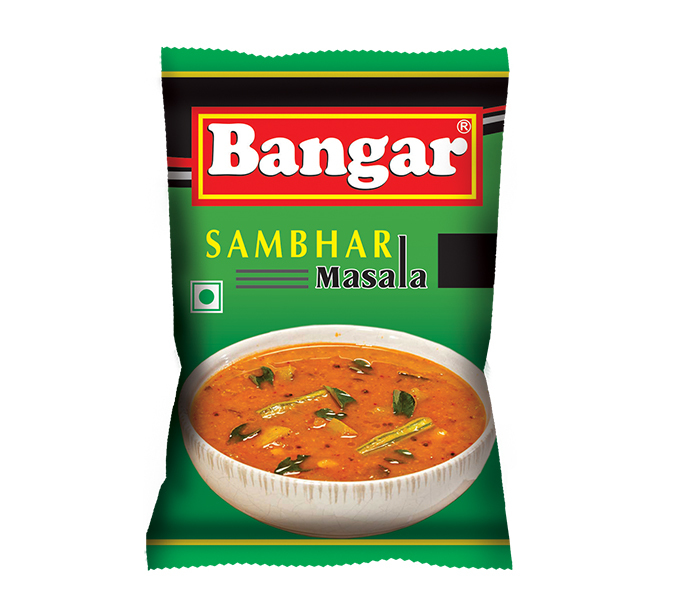 Bangar Sambhar Masala is an ideal for distinct style of sambhar. Each state in South India prepares it with a typical variation, adapted to its taste and environment. This blend of Bangar Sambhar Masala is suited to most of various sambhar preparations. Coriander, Cumin, Curry leaf, Fenugreek, Asafoetida, Black Gram, Bengal Gram, Cinnamon, Chilli, Salt, Pigeon pea, Tamarind, Rice & Turmeric. Soak 1/2 lime sized ball tamarind in 1 cup water for 20 minutes. Squeeze it out, adding water little to prepare 1 cup of juice. Wash and clean 1 cup toor dal (red lentils). Boil 2 cups of water and add the dal, 1/2 tsp turmeric powder and 1 tsp oil. As the dal boils, skim off the foam and discard. Boil until the dal is soft and then mash it coarsely. If needed add more water as it is boiling but do not let it get too watery. In a seperate pan heat to medium and pour in 1 tsp oil. Once the oil is hot, add 5 small dry red chillies, 1/2 tsp mustard seeds, 1/2 tsp fenugreek seeds & 6-8 curry leaves and saute for 2 minutes. Add 1 chopped onion and brown lightly. Add the tamarind extract and let boil lightly until the onions are cooked. Add this mixture to the dal with 1/4 asafoetida, 1 tomato (cutted in pieces), and vegetable of choice (beans,chopped carrot etc.) and 2 tbsp Bangar Sambhar Masala. Allow this to boil for 5-10 minutes and remove from the heat. Garnish with chopped coriander leaves. Stir the vegetable on a low flame for 3 minutes. Keep covered for 5 minutes, so that the vegetable holds on the flavour and aroma of Bangar Garam Masala. In a few minutes the delicious vegetable is ready to eat.